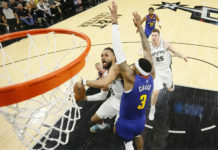 The game itself meant little for the Denver Nuggets, having been eliminated from the playoffs just a few nights earlier by the Oklahoma City Thunder, but Nikola Jokic still put together one of his most complete efforts of the season in Wednesday night’s season finale. Jokic finished the night with 29 points, 16 points, eight assists and five blocks in a 111-105 victory over those same Thunder, becoming the first player since Shaquille O’Neal to post such a stat line. It was Jokic’s 39th double-double of the season, and just two assists shy of his seventh triple-double. 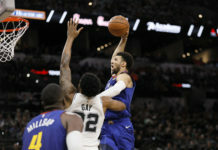 His 39 double-doubles were good for 15th in the NBA on the season and the first time since 2012-13 that a Nuggets player recorded more than 30 in a season. Kenneth Faried had 31, but did not record a triple-double. In the win, Jokic scored key points in the second half to help Denver erase an eight-point halftime deficit. Jokic recorded his five blocks all in the first half. The Thunder broadcasters, who saw Russell Westbrook record an NBA record 42 triple-doubles this season, described Jokic’s game as “kind of an odd game – he doesn’t really jump,” and seemed surprised when Jokic blocked a shot and took the ball coast-to-coast for a layup. For Nuggets fans, it was what they’ve come to expect from the Serbian big man now in his second year in the NBA. Jokic is under contract with the Nuggets for another two years, with the 2018-19 season being a club option. 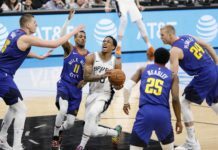 The 22-year-old is a bargain by current NBA standards with cap hits of $1.4 million and $1.6 million over those next two seasons; however, with plenty of money to spend, the Nuggets could offer their cornerstone player a raise this offseason and lock him up for the long-term.